You probably stumbled here from an old search engine link, and old bookmark, or from some old pages we left behind. More than likley though we screwed something up. If you feel generous you can spend a moment and drop us an email and let us know what got you here. 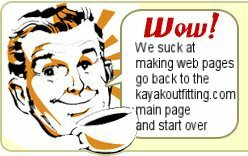 Don't give up on us, just click here to go to the KAYAKOUTFITTING.com main page and start over.